This section is from the book "Amateur Work Magazine Vol3". 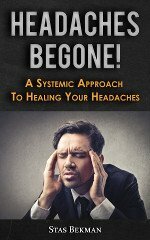 Also available from Amazon: Amateur Work. The skiff here described is one suitable either for a tender to a yacht, or for pleasure rowing on rivers, lakes, or ocean. This type of boat is very desirable for use in shallow water, as it is of light draft, while the round up of the bottom forward makes landing on a shelving beach very easy. At the same time the boat is very staunch, safe and easy rowing. While not as handsome as a round bottomed boat, it is less expensive, and can be built by any amateur very easily. The general scheme of construction is quite similar to that of the power dory previously described. The actual work will, however, be much lighter as the stock is not so heavy nor so long. The boat is 14' long on top, 12' long on the bottom, 4' 4" wide on top and 18" deep. It will carry four people comfortably and still be perfectly safe and easy to row. The bottom is built of pine with oak or other hard wood for frames, stem and sternboard. The bottom is 7/8" thick, and is laid out from the dimensions to the dotted line in Fig. 2. The lengths for this purpose are given in Fig. 1. It is left about 1 1/2" wide at the forward end. On account of its width it will require to be made in three pieces; one piece in the middle with a narrow piece on each side being the best arrangement. The joints are planed smooth and even with a slight concavity, so that when forced together the ends will surely be tight, or the edges may be tongued and grooved if carefully done. They are laid on a flat surface and forced together with wedges and fastened on the upper side with cleats 3" wide and 3/4" thick. These cleats should be placed midway between the moulds, which are in the positions shown, and are fastened with strong brass or galvanized iron screws. The bottom should then be beveled off on its under edge, as near as possible to the proper bevel, as it is much easier to do now than when the boat is set up. The centre line and the cross lines should be left on, as they are to be used in setting up the boat. 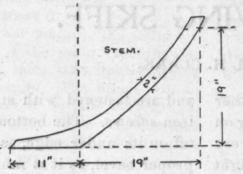 The stem is a crooked knee about 1 1/2" thick, cut away to the dimensions shown. As will be seen, the outer piece of the stem is bent in place later, as in the power dory. It is beveled off to about 1/2" wide on the forward edge to give a flat bearing for the plank and is fastened to the forward end of the bottom with rivets. 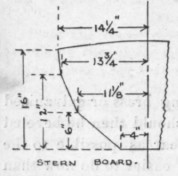 The stern-board is of 7/8-" oak, shaped to the dimensions shown; these dimensions are of the after face, and wood for a considerable bevel should be allowed for to be trimmed up exactly when the plank is put on. 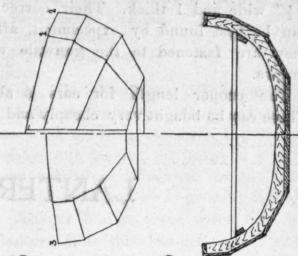 A light knee, shaped as illustrated, is fastened in the corner between the bottom and the stern-board ; it holds the latter in place at the proper angle while the plank is being put on. A row of galvanized nails is also driven through the after end of the bottom into the sternboard. The frames or knees are of natural crook, two alike being made for each form shown. They are 7/8" thick, 3" wide, and are fastened together in pairs. The centerhne should be marked across the foot of the pair and a brace should also be fastened across the top to keep them at the correct width. 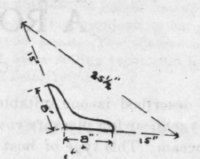 The bottom is now supported at its ends on two blocks or horses at about the right' height for working, the middle is then forced down 3 3/4" by shores from the beams above and held in place. The frames are now set up on the bottom in their proper places, with the joint between the two frames on the line across the bottom, and their centre lines agreeing with the centre line of the bottom. They should be set "plumb" using the plumb glass of a carpenter's level to adjust them. It will be necessary to bevel the heels somewhat to make them set plumb on the sloping bottom. When properly adjusted in place they are fastened from below with brass or galvanized iron screws. The edge of the bottom is then beveled off to the same bevel as each mould so that a straight edge laid on each mould will lie flat across the edge of the bottom, and the bevel between moulds evened up as nearly as possible. 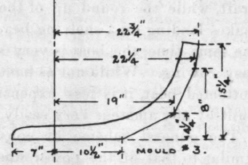 The plank is of pine 1/2" thick; it must be clear, well seasoned and free from knots, especially in wide widths, as there will be some "camber" to the planks, which must be allowed for. The planking is put on, starting with the lower one. A board is bent around the frames and temporally fastened with clamps; it is then marked about 1/4" below the first knuckle of each frame and the sternboard and around the top edge of the bottom. The plank is then taken off and a line drawn through the points near the top to outline the top of the plank. 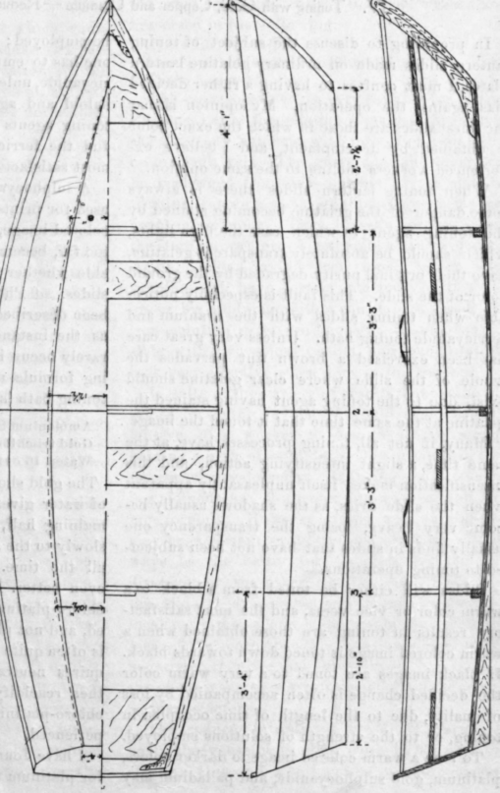 The width of the bevelled edge of the bottom is measured at several places and laid off from the line drawn around the bottom, to get the line of the lower edge of the plank. The plank is then sawed out, laid on again in place and any necessary changes made. The frames will require a slight amount of bevel to allow the planks to lie flat upon them. The plank for the other side may be gotton out, using this one as a pattern. Before fastening in place, the lower edge should be bevelled off nearly right, as it is easier to do this now then after fastening in place. The bevel on the top edge for the next plank above is formed as follows : with a gauge, mark a line on the outer surface 1" down from the top edge, and on the top edge a line 1/8" in from the inner surface ; the outer corner is then cut off to these two lines; the 1/8" on the inner edge avoiding a feather edge. The plank is now to be fastened in place, with the top edge about 1/4" down from the knuckles of the frame. It is nailed to each mould with several galvanized iron nails and also to stem and sternboard. The lower edge is now bevelled off even with the bottom and a row of galvanized boat nails driven through the lap about 4" apart and clinced on the inside. 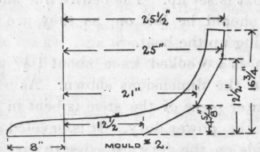 They should be of proper length to clinch over about 1/4" they should be bored for, and driven with the flat of the point along the grain and clinched across the grain. The ends of the plank are trimmed off just beyond the stem and sternboard. The second plank is shaped and fitted in about the same manner. Its lower edge is bevelled to match that on the upper edge of the lower plank, and its upper edge is lined and bevelled as before described. At the forward end both are bevelled off to bring the surfaces flush. Through the lap of the two planks galvanized boat nails are driven as before described. The top plank is fitted in the same manner and is carried 3/4" above the tope of the moulds. The lower edges of the two upper planks are rounded off, and at the ends are smoothed off even with the surfaces of the stem and sternboard. A false piece for the face of the stem is cut out of the proper width to cover the ends of the plank, and rounded off on the forward edge. It is fastened on with screws. Around the inside of the top strake and on the tops of the frames, gunwales 3/4" thick and 3" wide are to be worked; they are tapered at the ends to 2" wide. They are fastened to the tops of the frames and to the top strake 5 at the stern they are fitted neatly against the sternboard and a small knee riveted in. At the bow they are fitted to the inside of the stem and a V shaped knee or breast hook is worked between them and fastened with rivets. The top of the stem is rounded off as shown, and a 1/2" hole bored for the painter. The top of the sternboard also is neatly curved and the edges rounded. 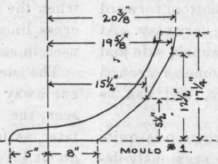 The skeg is of 7/8" oak, 4" deep at the after end, tapering off to about 1/4"; it fits the after curve of the bottom and is fastened by nails driven through from the inside. The skeg, while not always necessary, makes the boat row more steadily. The strips which supports the seats are 2 1/2" x 3/4" bent around inside the frames 6" down from and parallel with the gunwale. At the ends they are fastened to cleats. The upper edge is beveled off to allow the seats to lie flat. The seats are located as shown, and rest upon the strips just mentioned; the after seat is about 15" wide. When located in this way she will trim with either one, two, three or four passengers. The rowlocks are to be set into blocks on the gunwale as shown, 8" long, 2 1/2" wide and 1 thick. Their correct position can be best found by experiment, after which they are fastened to the gunwale with brass screws. The proper length for oars is about 8 ft. These can be bought very cheaply and are much better than can be made by the amateur, The bottom may be left clear or fitted with gratings between the frames. They are made of narrow strips 1/2" thick, nailed on to the cross pieces. They should come about to the level of the top of the frames, and are easily removaed for cleaning.